This was how it turned out for me. 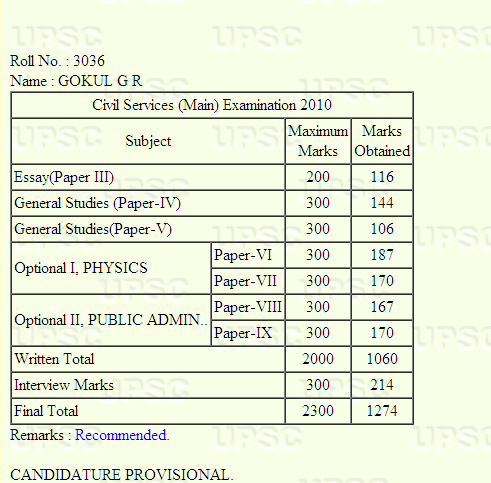 My correct attempt was 555 in physics (280 + 275), 580 in PubAd (280 + 300), 490 in GS (240 + 250). Expected more in GS 2. But it seems that most of the candidates got lower marks than what they had expected. My interview was scheduled for the afternoon session on the 4th of April 2011. After the document verification, by around 14.15 hrs, we were told that we will be interviewed by the board chaired by the UPSC member I.M.G. Khan. I was the last candidate in the list. Me: May I come in, Sir? The chairman asked me to come in. The room and the table were quite small. So I had a hard time distinguishing the chairman from the five members. Chairman: So you are Gokul? Ch: Gokul, you have taken Physics as an optional. Are you going against the trend as we see a lot of engineers and science graduates taking non-science optional? Me: Sir, physics is a subject that I have been studying form my school days. It is the most familiar subject for me and I like it. I wanted to take a subject that I would enjoy studying. Ch (going through my bio-data): So you passed out from NITC with first class with distinction. Some chap came to a place near Calicut some time back no? Who was he? Me: Vasco Da Gama sir. It was in 1498. He landed at a place called Kappad. It is quite near to my college. Ch: The beach has a memorial saying this is where he landed. Have you seen that? Me: I have been to the beach twice. It is a rocky beach. But I don’t remember seeing the monument. Me: sorry sir. I don’t remember seeing the monument. Ch: Why did he have to find a route through the sea? Me: I don’t exactly remember the details but the land route was blocked by some reason. Ch: No No that’s not possible. They could have found some other route. Me: Sea route is cheaper and it also facilitates large scale trade. Ch: Yes. Besides don’t you think it is safer? Taking the land route they would have to come through hostile territories and through bandits and hooligans. But again they face pirates in the sea route. Ch: Why did the Europeans land in Kerala? Me: They were looking for trade in spices, especially pepper. Ch: Is spices still an important component of your state’s economy? Me: Yes sir. Spices are still a major component of our exports. Ch: Why is that Kerala has not been able to diversify from traditional agricultural commodities? Why is Industrial growth not strong in Kerala? Me: There is a general lethargy within the government and people about inviting capital and setting up an investor friendly climate. We also have a very strong trade unionist culture. It definitely has positives for the society. The wage rates and working conditions are one of the best in India. But various elements have misused it and used it for personal ends at the expense of industrial growth. It was a mindset that was set in the 1970s and 1980s that is still preventing investors from investing in Kerala. But we are definitely changing. We just commissioned the vallarpadam project and signed the agreement for the Smart city project. Ch: So you think that the situation will change? That the future is bright? Me: The change is already happening. It has already started sir (smiling). Ch: Tell me about this smart city. Me: It is a PPP between the Kerala Govt. and Dubai’s Tecom to set up a Technology park which will provide the necessary infrastructure for software and electronics firms to set up office. Ch: Where exactly is it? Me: At Cochin. Kakanad to be exact. The chairman nodded at the first member. Having taken Physics as an optional, his questions were only on the safety of nuclear power and nuclear reactors. M1: In the context of the Japanese disaster, do you think we should continue our expansion plans for nuclear energy or should we stop it? How safe is nuclear energy? Me: Nuclear energy is a dangerous technology and it can never be 100% safe. But nuclear energy is a vital energy source for the future. So stopping it is not an option. But we should put in place better safety and security systems. Even in the Japanese case, the reactors withstood the 8.9 magnitude earthquake and the tsunami and the reactor stopped working also. But it was the failure of the cooling system due to the damage to the electric grid that led to the current crisis. M1: So what all should be done? Me: We already have better safety systems. Our reactors are PHWRs as opposed to the BWRs of Japan which are inherently safer. Besides, the newer reactors have a Passive heat removal system by which air can be used for cooling in the event of failure of active cooling systems. New reactors will also have Hydrogen capture systems to prevent the kind of explosions that occurred at Fukushima. M1: But still you think it won’t be 100% safe? Me: Achieving a 100% safety line would be impossible but we should put in place mechanisms and safety systems to take the safety level as near to 100% as possible. Besides the safety guidelines should be placed under an independent regulatory body outside DAE. M1: Very recently the former chairman of the AEC said that India should not import foreign reactors. Even he is not so sure about the safety of the rectors. Me: The foreign reactors especially Areva’a EPR 1600 has untested safety features and has been rejected by a number of nations. Also, foreign reactors will have different safety systems and we will have to be experts in each of these. We will also have to depend on foreign know-how to learn their safety features also. But our reactors have been completely designed by us. So we have a better understanding of their dynamics and can better perfect the safety systems for them. Even the former chairman has supported the use of indigenous reactors. M1: The proposed reactor at Jaitapur is coming up in a seismically active zone. What all measures need to be taken to prevent damage due to earthquakes? Me: Building standards need to be strictly applied. Earthquake-resistant technology need to be incorporated which building. The effect of this was seen in the recent earthquake in Japan. The 8.9 magnitude quake, which is one of the largest ever killed only 20,000 people while the 7 point magnitude quake in Haiti last year killed more than 2 lakh people. M1: You said about smart city? What all are the criterion for selecting a place for setting up a project like this? Me: Connectivity to major city centres, road and rail connectivity, presence of good colleges in the vicinity. The chairman interrupted asking me whether human element is also a factor that is considered. Me: Yes sir. Availability of prospective employees is a major factor. If a Keralite is given a choice between a job in Smart city and in Bangalore, he will choose smart city even if the salary is a bit less. Given that about 50,000 engineers pass out from Kerala every year, this will give a competitive edge for the recruiters. The turn was passed to the second member, a lady member. Her questions were about social issues. M2 (looking at the summary sheet): You were selected as the ‘Young Scientist’ at the National Children’s Science Congress and you were second in the Regional Mathematical Olympiad. Why have you chosen civil services after coming from a science background like this? Me: The project that we did for the Science congress has in fact played a very important role in me choosing civil services as a career. It was a social project. It was about the nutritional status of the people in a particular rural area in my district. The project gave me a firsthand exposure to the problems in the rural areas and about the various government departments working on these issues. The results of the project painted a very grim picture about the nutritional status of the people with respect to protein and vitamin deficiency. Besides, my aptitude is in an administrative job. Civil services will offer me the variety and challenges that no other job can give. I chose engineering because of my interest in science and to keep my options open. But civil services have been my dream throughout. It was always there in the back of my mind. That was why I started my preparation at the end of my third year itself. M2: Suppose you are posted as an SDM in your state. What will you do to improve the nutritional level of the people? Are you aware of any schemes in that regard? Me: ICDS, PDS, NRHM etc are the schemes for improving the nutritional and health levels of the people. Most of these projects suffer from poor implementation and leakages. For e.g., in ICDS, the anganawadi workers are ill-paid and their responsibilities are quite heavy. This has led to a lack of morale among them. I will concentrate on proper implementation of such schemes. M2: But as an SDM you cannot make policy decisions. You can’t give them more salary. What will you do in that context? Me: I will look for implementation of the schemes with support from the local bodies and community organisations. Involving of Panchayats can also create the political pressure for change. M2: Kerala is called ‘God’s own country’. In what context is that name used. Me: It is essentially a tagline coined by the tourism department for promoting tourism in Kerala. But otherwise also, Kerala can be called God’s own country (smiling). With this, the Third member took charge. He was jovial throughout. M3: You have taken public administration as an optional. Do you think decentralization through Panchayati raj is good? M3: Then why is it that in spite of being inserted in the constitution, it is not properly implemented in many places? Me: Although they have been inserted in the constitution by the 73rd and 74th amendment, it is still the prerogative of the state governments to delegate powers to these bodies. In the case of Kerala, most of the powers in the 11th and 12th schedule have been delegated. Besides, 25% of the plan expenditure in budget is passed to the local bodies. M3: So what should be done in the other states? Me: People should be politically motivated and should demand more powers. Education can play a very important role in this. M3: Tourism is affecting our culture. Should we stop tourism due to that? Me: No sir. We should not close ourselves to anyone. The tour operators act as the interface between the tourists and our people. They should be given training and orientation to properly orient foreign tourists before they land in India. The foreign tourists should be given a basic idea about the culture and society into which they are stepping in. Me: A well educated society is definitely good for developing a service industry like tourism. That should be our long term goal. But in the short term, educating the operators will help us develop tourism sustainably. M3: A DM was recently kidnapped by the Maoists. In such a dangerous environment, do you still want to be an IAS officer? Me: I heard about Mr. Vineel Krishna for the first time after the incident. All the reports in the newspapers were very positive about his work as a DM. In fact, he was kidnapped when he went to check a development work in a remote area without any protection. The people of his district rallied behind him. So if you are upright and do your work, you will have the support of the people and will be perfectly safe. M3: So you think if he is honest and upright, nothing bad will happen? The turn was passed to the fourth member. M4: Did you write CAT, GRE or GATE in between? Me: No sir. I was preparing through my final year and gave the exam right after my final exams. Me: Better connectivity, ability to make fast economic decisions, buying and selling goods using mobiles, advertising. Me: People and families are always connected. You can call everyone at any distance at very low rates at any time. When I thought for a while, he said ‘it’s Ok, if you can’t think of any’. M4: What are the uses of space technology for people? Me: It has revolutionized communication. Weather satellites like Metsat help us in better prediction. Remote sensing satellites help us in planning. We have recently put in orbit Oceansat which observes the ocean. The information gathered by it is beneficial for the fishermen. M4: Cyber security is a major issue now. What do you know about it and what is being done by the Indian government? Me: It is a very dynamic area. It is a constant battle between a large number of hackers and security establishments. We need to keep ourselves updated always. DRDO is developing an operating system for use in govt. systems. The operating systems that we use now are available throughout the world and hence are more prone to hacking. We have set up cyber cells in the major police stations. The CERT-In is the body that is responsible for cyber security at the national level. Me: The set of standards that we are supposed to follow in a particular realm. M4: Can you point out some of those that you are supposed to follow. Was there any committee that made recommendations about ethics? Me: It was a committee that was appointed in the U.K (couldn’t remember the name of Nolan committee) that gave detailed guidelines regarding ethics in public life. Me: A number of committees to look into corruption have also given similar recommendations. M4: Can you list out a few of those standards? M4: Those are general things. Don’t you have any set of professional ethics as an engineer? Is there any Body that sets such standards? Me: IEEE sets the standards for us. But I am not aware of any code of ethics. M4: No Indian bodies? IETE? Me: Sir, do you mean ISTE? M4: No, IETE. Ok, tell me the ethics that you are supposed to follow as a communications engineer. The chairman took over. The interview was in its last phase. Ch: Very recently a Bulgarian group was arrested in Delhi for robbery. What does this incident mean for India? Have we become a soft state that people from faraway places are coming for robbery? Me: It may be a random, off the cuff incident. Ch: No no. It was a well organized group with a lot of members. Ch: So Gokul, what will you do after getting out. Tell me the first thing that you will do on exiting this room. Ch: Ok. Your interview is over. It has been nice talking to you. Thank you. I thanked the chairman, the lady member and other members and left the room. It was 17.20 by then. The interview went for around 30-35 minutes. The session felt more like a candid discussion rather than a strict interview. Hoping for the best! !